I just started playing the new Animal Crossing for the Wii. Yes, I even stopped playing Fallout 3 for it. But I have an excuse: I haven’t had a large block of time to devote to it the last two days. I also have the excuse that Jen, John, and Crystal are playing it, and the fact that the multiplayer is decent. That’s all I’m going to say, because I’m sure we’ll discuss it in an upcoming Chainsaw Buffet Podcast. Now for the question you’re probably asking yourself: how can I play such a stupid, mindless, pointless game? But seriously. It’s all in how you approach it. Because, you see, I’m not just moving into a new town and building a house. Oh, no. That’s not what I’m doing at all. I’m fighting back against The Man. And by The Man, I mean that unscrupulous businessman Tom Nook. 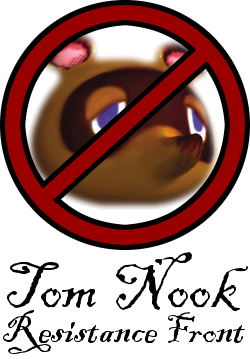 But not directly; for now, I am merely spreading propaganda based in truth–the truth that Tom Nook is the embodiment of all that is evil. And I wait. And I work. One day I will earn enough money to be free of his tyranny; to overthrow his monopolistic rule over all of Animal Crossing; to end his raccoony paw stomping upon the face of humanity forever. Join me, friends. We will stand fast as the Tom Nook Resistance Front. Together we will rise up against the corruption, and Nook’s days shall be numbered. My Wii friend code is 1977-3675-3717. Posted in: Fake News on November 19, 2008 by The Maitre d'.